Frank Gore is the unquestioned backfield leader in Indianapolis, but there is still an open competition behind the veteran. Ferguson has missed the team’s first two preseason contests, but will look to make an impact in his final two games prior to Week 1. 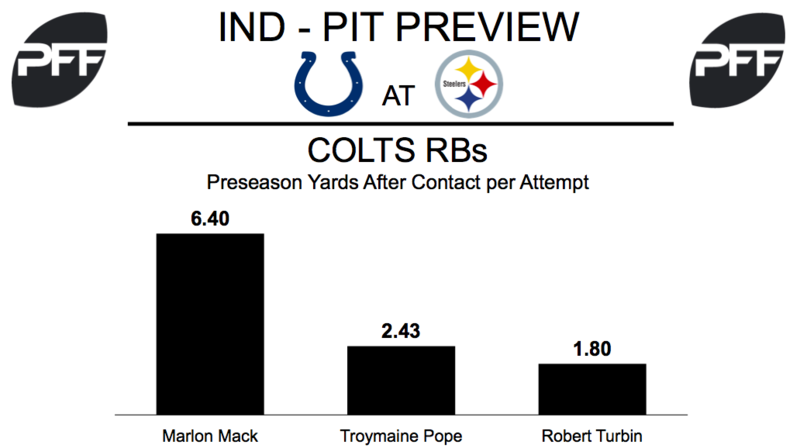 Turbin was the Colts’ primary third-down back in 2016, leading the team with a 54.1 elusive rating and 2.47 yards after contact per attempt. This preseason, Turbin has forced two missed tackles on 13 touches. Mack had an excellent showing in his Colts debut last week against the Cowboys. Not only was his 84.1 overall grade the highest on the team, but the rookie forced five total missed tackles on just seven total touches. This gave him a crazy 548.6 elusive rating. Pope also finds himself in the backfield mix after a strong summer. The 2016 undrafted free agent has shown well as a runner (132.5 elusive rating) and as a receiver (game-high 90.4 receiving grade against Dallas). Pope forced five missed tackles on just three receptions last week. Scott Tolzien, QB – With Andrew Luck’s Week 1 status in question, Tolzien has taken most of the first-team snaps in camp. The signal caller has earned an 86.0 passer rating when kept clean this preseason, compared to a 47.9 passer rating when under pressure. Tolzien has yet to attempt a deep pass (20 or more yards downfield). Akeem Ayers, ED – Indianapolis has a number of edge defenders competing for snaps heading into 2017. Ayers earned the defense’s highest overall grade (80.7) last week against the Cowboys, picking up a quarterback hit and two hurries on 15 rushes. The edge rusher accumulated 359 snaps for the Colts in 2016, totalling 12 pressures. Brian Schwenke, C- Schwenke was recently activated from the active/PUP list, and could assume the starting center spot with Ryan Kelly set to miss the start of the season. The first-year Colt started three games at left guard for Tennessee in 2016, allowing seven total pressures on 128 pass block snaps. He and Deyshawn Bond could see significant snaps in the Colts’ final two games in order to determine the team’s Week 1 starting center. The Steelers will reportedly use T.J. Watt and Bud Dupree as their starters with less of a rotation than last season. But Chickillo and Moats have been two of the best players on the team this preseason. Chickillo was the highest graded player against the Falcons with an 85.9 overall, his first game action this preseason. While Moats has graded no lower than 81.8 this preseason. 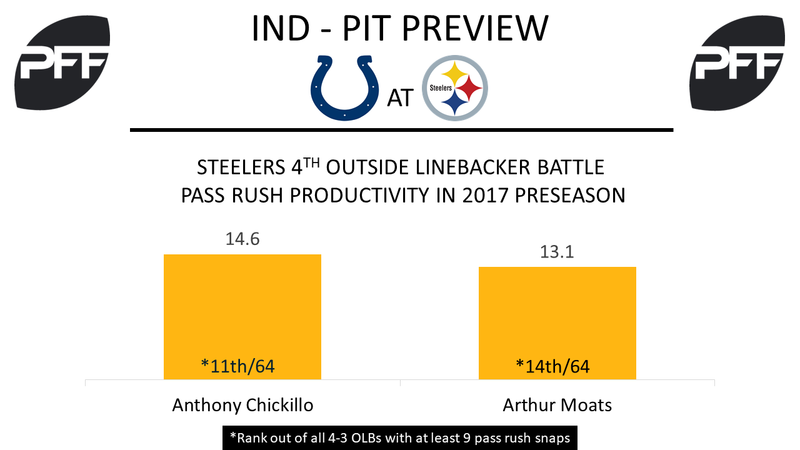 Both have produced when rushing the passer this preseason, ranking in the top 15 among 3-4 outside linebackers in pass-rush productivity, Chickillo ranks 10th and Moats 14th. The veteran Moats leads the NFL in sacks at the position and Chickillo led the position in Week 2 with two sacks and four defensive stops. While Chickillo has the slight edge in run defense with two run stops compared to Moats’ one. James Conner, HB – The rookie’s first NFL game action was a bit up and down. Conner entered the game near the end of the first quarter and finished the game with 98 rushing yards but dropped 2-of-3 catchable passes. That’s as many drops as he had on 28 catchable passes in his college career. Conner showed the burst that he had in college with 2 runs of more than 15 yards against the Falcons, more than all the other Steelers running backs combined this preseason. L.J. Fort, LB – Fort continued his impressive preseason with an 84.5 overall grade in Week 2 to follow up his 81.9 in Week 1. His nine defensive stops not only lead all linebackers but its more than any other defender this preseason. In coverage, Fort has done well, only allowing 14 yards on two receptions and four targets while playing the third most coverage snaps on the team. Jesse James, TE – The incumbent tight end is expected to be given the starting job after only being targeted 3 times this preseason. After entering the preseason in a battle with Xavier Grimble, James has shown enough consistency without a single drop and not allowing a sack in his 29 pass blocking snaps.